Believe me, we had NO idea what we were in store for! When we booked our apartment in Valencia, Spain for the month of March, I was told that we were lucky — we would be there during Las Fallas, a celebration that happened every year at the same time. I did a little research and was looking forward to witnessing a rich cultural tradition wrapped up in an incredible amount of noise and colour and excitement. But it was one thing to read about it — and another thing entirely to be there while it was happening. Now don’t get me wrong, I thoroughly enjoyed it all — the parades, the music, the colourful traditional clothing, the throngs of people in the streets, the street parties, the special food and drink, the amazing papier-mache monuments that magically appeared on street corners and in squares all over the city, the gorgeous, elaborate, moving light displays that rose up over the streets. Yes, I enjoyed it all — EXCEPT for the firecrackers that went off incessantly — at all times of the day, starting in early March and increasing until March 19, the end of the celebration. I didn’t mind the mascletà, the fireworks display that took place at 2:00 pm every day in the main city square, the Plaza del Ayuntamiento. This is a display of gunpowder explosions that beats out a unique sound. The mascletà was noisy, but at least it was predictable. I knew when it was going to happen, so I could manage to be far enough away — preferably in a nice sidewalk cafe eating something delicious — so that the noise wouldn’t startle me. It was the firecrackers that I wasn’t too fond of. They were totally unpredictable. As the middle of March drew closer, the frequency with which people throughout the city set off firecrackers increased to any time and anywhere. These sharp cracking sounds often startled me and made me jump. Bob seemed to find this very amusing. “I’m sensitive,” I would say, over and over. 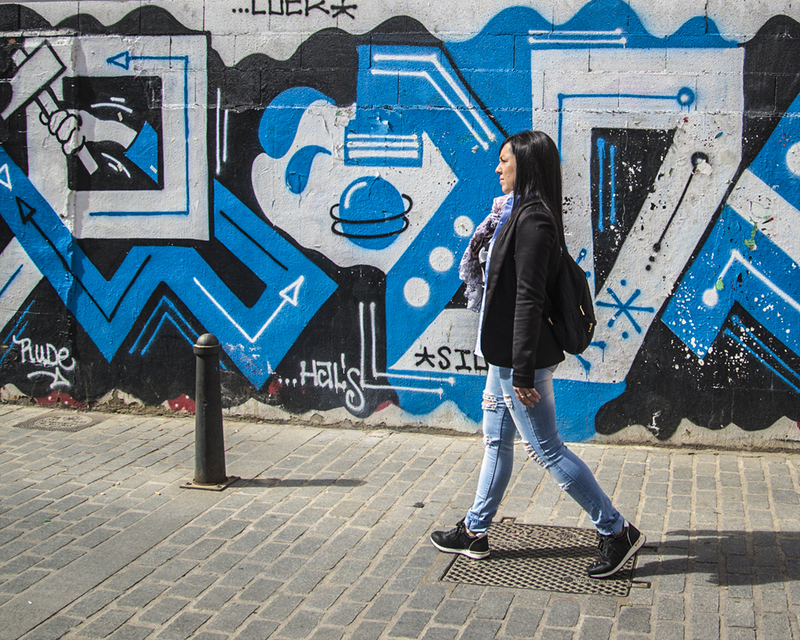 This was not a posed picture, it was street photography, Fallas style. More images caught by chance. A common scene as kids all over the city of all ages — in traditional dress and not — had the time of their lives setting off firecrackers in the streets. But really, the rest of Las Fallas was fascinating and delightful. It’s astounding to watch as an entire city gets wrapped up in a frenzy of sorts, and as tens of thousands of tourists from all over Spain and other countries converge on Valencia. 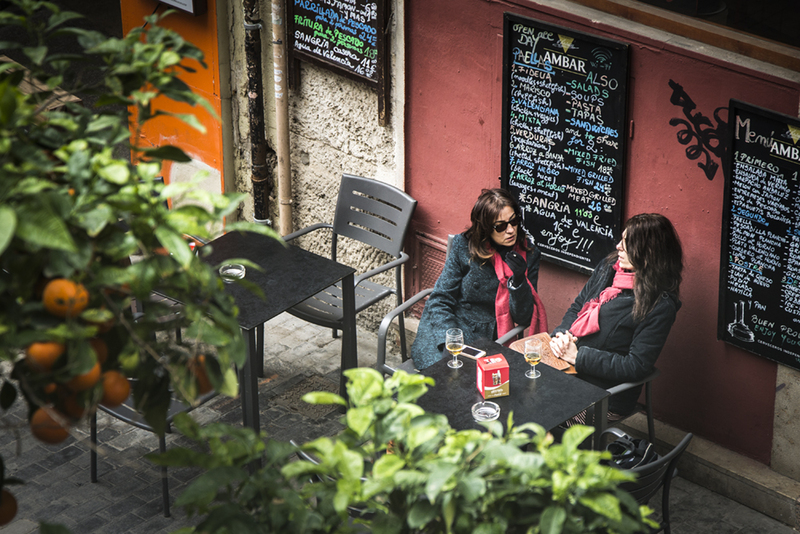 I can’t tell you how many times we would be sitting at a cafe having tapas and imbibing a beverage or two and a small marching band would come down the narrow street with trumpets and trombones blaring. Yes, it’s an excuse for a big party, but it’s much more. What I loved was that it celebrated all aspects of Valencian cultural traditions. You can see every expression of the Valencian identity (music, costumes, rituals). You could not go anywhere for several weeks without seeing girls and boys (falleras and falleros) dressed in 17th and 18th century traditional costumes walking through the streets. And they were usually quite proud and happy to pose for pictures. So what exactly is Las Fallas? The term actually refers to three things — the celebration itself, the enormous paper-mache monuments in the shape of cartoonish people and things that were often as tall as buildings, and the Fallas community of neighbours that are the moving forces behind the whole festival. Las Fallas originated from an ancient ritual of spring in which villages put all of the scrap wood and broken furniture from the previous winter into the streets and set it on fire. In a way, it signified getting rid of the old for a new beginning, a kind of purging. The large falla statues have many ninots (smaller figures) attached to them and the whole thing is a feat of engineering. They are constructed in a precise way, so that when they burn they collapse safely. The monuments and ninots generally satirize culture and society, and the themes range from current affairs to local traditions. Yes, Donald Trump was represented. This was one of the most popular fallas which was located in the Ruzafa area of Valencia. We saw it the night of la planta as it was being finished. You can see the scale of it compared with the people admiring it. Before the festivities, we went to see the Exposició de Ninots at the Museum of Science where we could look at the ninots up close. We voted with everybody else (for a small fee) for our favourites, and the winning ones will be saved for next year. The rest are burned on the night of the cremà. A familiar fellow — my size — seen at the Exposició de Ninots. The craftsmanship of the ninots is remarkable. We met a wonderful Valencian woman named Vicky who told us about Las Fallas from her perspective. Most neighbourhoods have a Fallas club, which spends a whole year raising money and holding parties in order to hire an artist to design and construct a large and exuberant statue that would be the focal point of the celebration for them. She was part of such a club in the beach area of the city and she was getting more and more excited as the main days of the festivities grew closer. She advised us which areas of the city had the best Fallas and lighting displays. Vicky told us that Las Fallas was run totally by Valencians, it was not government-supported in any way. There is a competitive element too. There are competitions among everyone for the best everything — costumes, fireworks, statues, ninots, lighting displays, you name it. Las Fallas serves as a focus for neighbourhood communities, which strengthens them and keeps them active and cohesive throughout the year. Ruzafa is known as the area with some of the best lighting displays as well as Fallas so that is where we headed on the night of the planta. I wasn’t sure what time they would be lit so I was in place with my monopod about an hour too early. But it was fun to people-watch. Despite the large numbers, everyone was respectful and in a good mood, and there were no problems whatsoever. As a festival for all the senses, Las Fallas culminate with the cremà, or burning of all the monuments, on March 19, which is St. Joseph’s Day and Father’s Day in Spain. This fire ritual consumes a whole year of work — a whole year of dreams. At 10:00 pm the children’s fallas are set to the torch, amid music and fireworks. At midnight, Valencia astonishes the entire world each year by burning its street monuments to ashes, ending with the biggest fallas whose budgets are in the range of many thousands of euros. We decided to avoid the huge crowds downtown and took part in the cremà in our local neighbourhood. The small fires there were big enough for me! I was gobsmacked to see the tiniest of children learning how to set off firecrackers. But Vicky told us that the parents teach them young how to handle them safely. After the children’s falla had burned down, the children held hands and dance in a circle around the embers to traditional music. Oh yes, there are firefighters and hoses present at every burning to make sure nothing goes awry. The question everyone asks is why burn statues that cost so much to make in time, energy and money? I liken it to the intricate and beautiful sand mandalas that Buddhist monks work on painstakingly for long periods of time only to destroy them in the end, revealing that everything is impermanent. The day after the burning Valencians wake up to a new morning and are already starting to think about the fallas they will build the next spring. It’s spring renewal unlike any I’ve ever seen. Valencia in the spring was full of wonders. There were just so many visual delights and so much that I wanted to preserve with my camera. 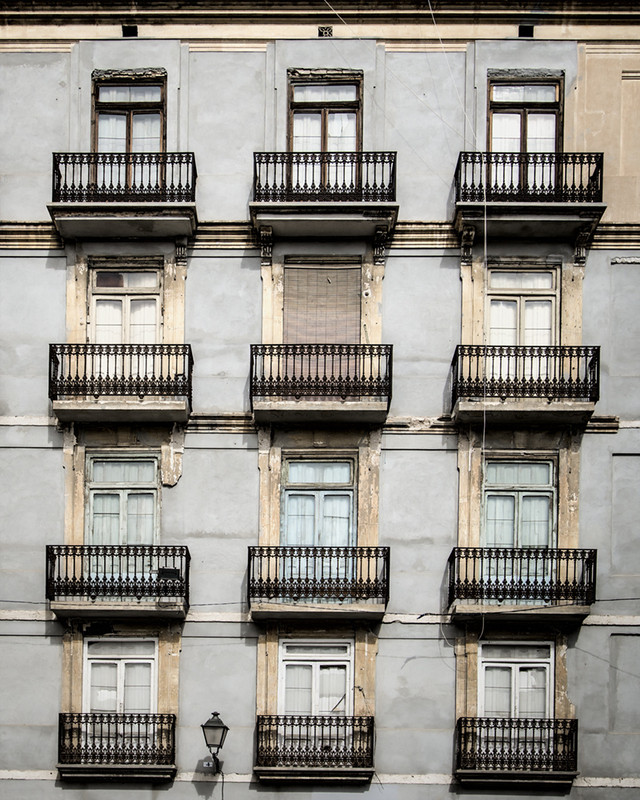 Now that I’m back from my Spanish odyssey, and as I go through my images, I notice a preoccupation with certain subjects — balconies being one of them. It seems I was always looking up to appreciate elegant and intricate balcony design, which also has a very functional use. The hot and sunny Mediterranean climate is perfectly suited to balconies from where residents can enjoy their own outdoor space, or simply watch the world go by on bustling streets below. 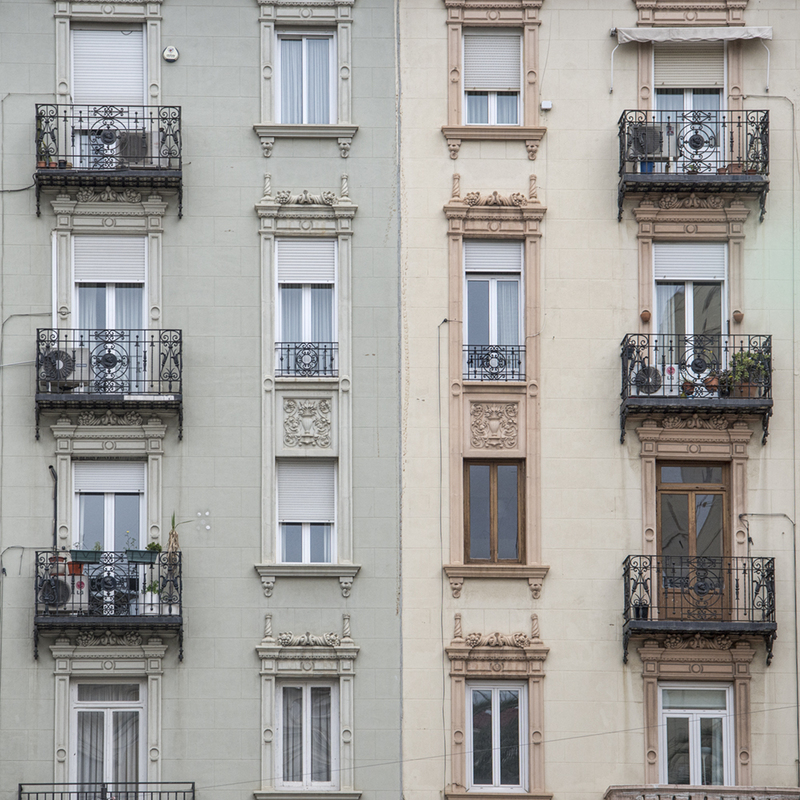 I’m drawn to the symmetry and repetition of multiple similar balconies, as well as the opportunities they provide for individual self-expression. One of the most satisfying ways to explore a new place is by noticing and appreciating the patterns in the built environment around you. I don’t discriminate in my affection for patterns — I enjoy patterns from all decades and eras. Bold or subtle, symmetrical or not, I seek out patterns for how they make me feel and what they teach me about a place. One thing that always attracts me whoever I go is ceramics. And Valencia is just full of gorgeous examples. The history of ceramics in Spain is a long and fascinating one and includes Moorish and Chinese influences. I particularly loved the tiled ceiling of the North Railway Station, which was decorated in an Art Nouveau style. This is just a small taste of the luscious patterns of Valencia. Valencia! Or Valenthia, as it is pronounced here…What a lovely place to spend some time in the spring. Oranges, paella, tapas, Agua de Valencia (a local cocktail), horchata (a milky drink made of tiger nuts), Las Fallas (an annual cultural celebration in March) and warm climate are all immensely appealing to me, as is the history, culture, architecture and Mediterranean coastline. And that’s just for starters. I’ll be doing a series of posts on Valencia as I explore the area with my camera. But since I just got here, let me start with a short post on what first grabbed me — the colour! 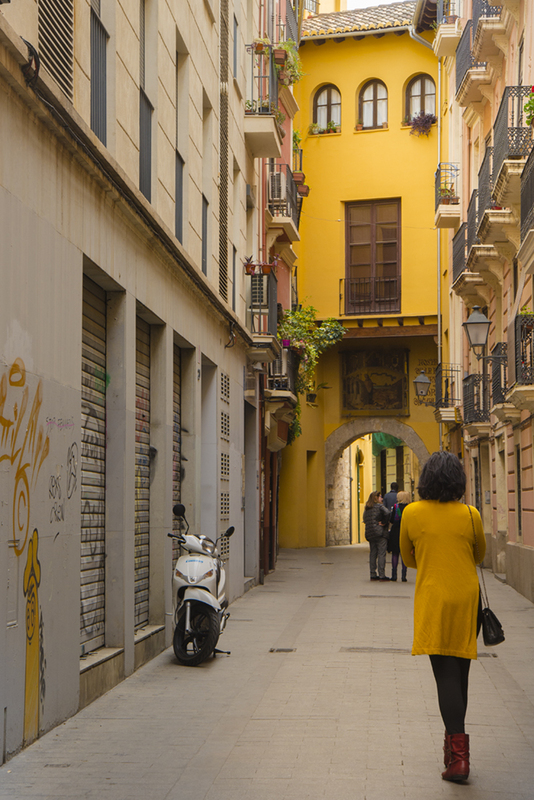 So here’s some of my first impressions of this fascinating city, the third largest in Spain.